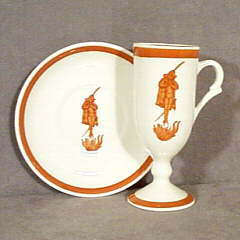 Carr's Cafe Brulot cups made for Brennan's Restaurant in New Orleans are always a popular piece with collectors. The pattern is known as "Diable" (also called Jester King) and was distributed by Loubat's in New Orleans. Pieces are typically white wares and decorated in either brown or crimson (red). If you own a set and have never used them, I found a great recipe for Cafe Brulot in a cookbook published by the Tampa, FL Junion League entitled "The Gasparilla Cookbook." Give it a try! Mix these ingredients in a hard metal bowl, light flane and dim lights. Ladle 20-30 seconds and then add 4 demitasse cups double-strength hot coffee. The second batch is even better than the first (per the cookbook). According to the footnote, this recipe is from Arnaud's in New Orleans. In our continued efforts to try to connect Carr China Company history with the people who worked there, we've recently located a 1939 article that lists Carr China Employees who participated in a November 30, 1939 American Red Cross drive. The article states that more than $800 was collected in the drive across Taylor County, West Virginia. The Carr China workers who each contributed $1 included: Kenneth W. Barcus, Melvin Bartlett, Violet Bartlett, L.F. Baugh, Josephine Bolyard, Jessie Boyd, Walter Byles, Della Breedlove, Lila Breedlove, John Bredlove (sic), Gusta Bryan, Ronald Carld, James Chester, Jr. M. Cody, Dora Cole, Mildred Cornwell, Clee Curry, Olive Dougherty, William Dayton, Lucille Deck, Ebert Duckworth, Frank Elliott, J.P. Flanagan, Ethel Foley, Polly Freeze, J. J.Frey,, L. C. Frey, W. J. Frey II, Kathleen Gerkin, Velma Gilbertm Dan Gillespie, William J. Glover, Marion Gough, Esket Harden, Claude Hendricks, R. E. Hilkey, Hazel Hodds, A. C. Hoskins, Oscar Hyett, Charles Isner, H. F. Isner, Dewey Jones, Glenn Jones, Edward Kirby, Eugene Kirby, Lonnie Kirby, Roy Kirby, Margaret Lake, Bernice LaRue, Floyd Lisk, Viola Lorentz, J. P. Luke, Earl McDaniel, Roy McDaniel, Helen McDonald, H.G. McPhail, Virginia McWilliams, Virginia Mahaffrey, Marie Malone, Hence Marshall, Jetta Mason, Alex Mathew, Anna Miller, Ethel Mider, A. B. Moats, Birgie Moats, Edna Moats, B. D. Montgomery, Herbert Moore, Nella Moore, John Morgan, Cecil Mylone, C.C. Myser, Ellen Norris, Bessie Polling, George Pugh, Howard Pugh, Clair Reed, Edward Reed, Sanford Ringler, Maxine Robinson, Meriam Robinson, Charless Rupp, Edith Sapp, Ralph Sapp, Raymond Sapp, Richard Sheets, Dorsey Shingleton, Pearl Shuttlesworth, Elsie Silcott, Russell V. Smith, G. W. Staton, Pansy Stevenson, Lillian Tucker, Paulise Utsinger, Albert Woodyard, Roy Woodyard, Virginia Wright and Aileen White. Please share with us your stories, memories and thoughts about the life at Carr China. If you have artifacts or documents that you are willing to share that do not lend themselves to the input form below, please contact the webmaster at: Carrmaster@carrchina.com Thank you! What position(s) did you hold at the Carr China Company? What year(s) where you employed with Carr China? May we contact you for additional information? Please enter the telephone number, mailing address or e-mail address (preferred) that you would prefer we use to contact you. Please share any ideas you have on how we can use this page to best support former employees and friends of Carr China. This plate was made as a commemorative item for an employee staff party held on December 17, 1946. 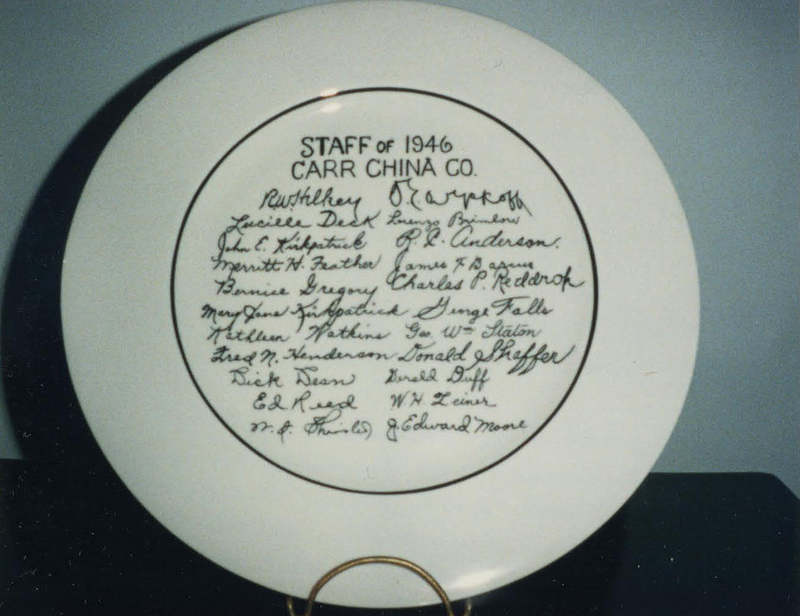 While the plate is signed by many of the company's plant managers, supervisors, various department heads, missing are the signatures of Edith Carr Bachman, President and Wheeler Carr Bachman, Secretary-Treasurer and Acting President. We've attempted to translate the signatures on the plate below. If you have more information about these people, corrections to spellings or other stories, please share them with us!